InfluencerBot – Meet the newest member of your marketing team! Give InfluencerBot a list of Instagram usernames (influencers, partners, competitors, etc) and it will track follower growth and more. Think of it like an employee that never sleeps. What Influencer information is tracked? When an Influencer is added to the tracking list, InfluencerBot will track their follower count growth and post frequency (per hour). How often are Influencers tracked? Influencer profile information will be captured every hour and added to your live reports Google Sheet. Are private Instagram accounts checked? Currently InfluencerBot does not support tracking of private Instagram accounts, but this feature may be added in the near future. How do I use the Influencer tracking metrics? By looking at follower growth, you can gauge the health of any Influencer account you are considering to sponsor a post on, measure the growth of your own account, or see how fast a competitor’s following is growing. By cross referencing follower growth with the post hour, you can optimize the time of day of your sponsored posts. 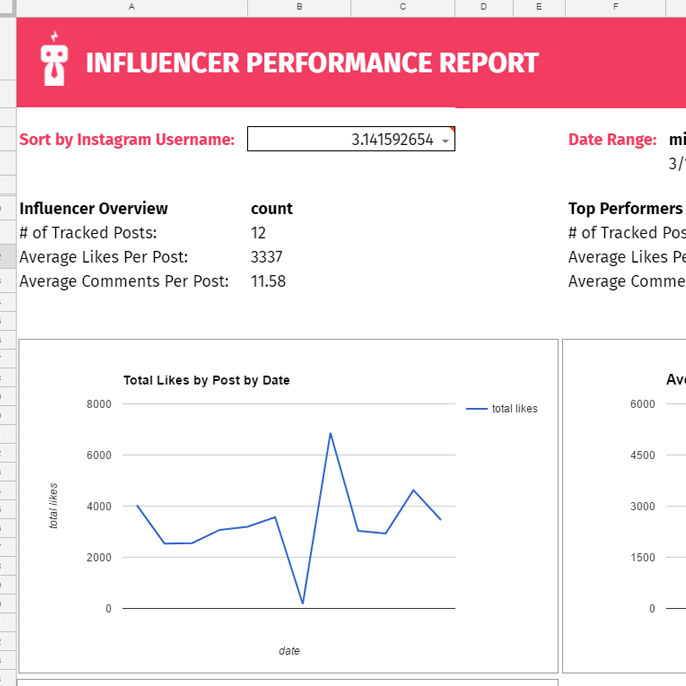 The hardest part about working with Influencers is tracking the results of organic reach. Monitoring when posts go live, measuring engagement, best time of day, etc. can all become a full-time job very quickly. InfluencerBot can identify keywords on your Influencer’s posts and notify your Slack channel with all the details. When the post goes up and is taken down, you’ll always be the first to know. Additionally, everything is always tracked in detail and stored in a live Google Spreadsheet. When you work with new influencers on instagram, they are expected to post your brand’s content. At this point, you will want to add the influencer’s instagram username and a keyword for InfluencerBot to look for in their posts. 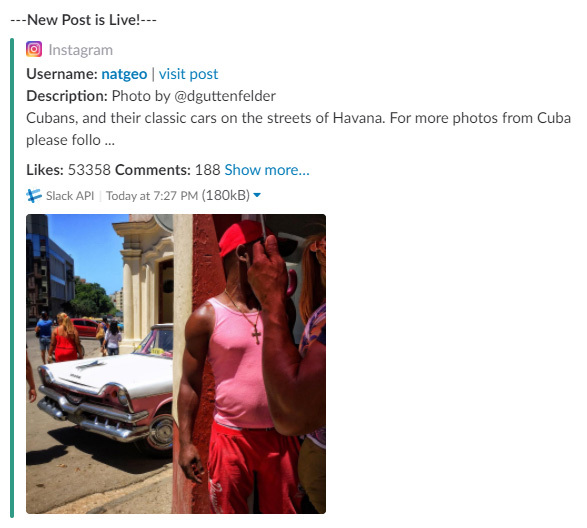 Once the keyword is detected in a post, a notification will be posted in Slack and the post details will be tracked and logged for 24 hours. How do I Track a Post? Enter keyword for InfluencerBot to watch for. How do Post Tracking notifications work in Slack? When InfluencerBot discovers your specified keyword for a given influencer, it will send you a notification in the Slack channel containing the bot. The ntification will contain the post details such as Link to Post, Image, Description, Like/Comment/View Count, Time Posted, etc. Once the post has been removed from the page (or 24 hours has passed), InfluencerBot will notify the channel that the post has been removed. Where can I view my Post Tracking history? All Post Tracking history is logged in the Reports section. The final power of InfluencerBot is the on-demand reporting of all your data. When did my influencers post about me? What was the engagement on those posts? Are my influencer’s profiles losing followers or engagement? InfluencerBot can send you a live report whenever you need it so you always have the data to make proper marketing decisions. What information is shown in reports? All reporting information provided by InfluencerBot is updated in a live Google Sheet personalized for your account. The Google Sheet contains different tabs for each feature the bot has to offer. This currently includes, all Influencer Recommendation History, Tracked Post History, Influencer Profile Snapshots, and Your Brand/Company Profile Snapshots. What is an Influencer Profile Snapshot? When you begin Tracking and Influencer, InfluencerBot will take hourly snapshots of their profile. This is valuable to monitor the growth or decline of an Influencers Follower Count, Engagement Rate, etc. Your data will automatically be pushed to the live Google Sheet link every hour. Can I customize the live Google Sheet? If you’re going to modify the Google Sheet, we recommend adding an additional “sheet” and importing column/row ranges to manipulate data. Otherwise your changes may be overwritten. Alternatively you can download as csv or duplicate the sheet. Can I connect my reports to Google Analytics? Of course! We highly recommend importing your InfluencerBot report data into whichever analytics software you use. The reason we chose to use Google Sheets as a data source is to make Google Analytics connection easy. Google Sheets comes with with GA integration add-on. Read More about this feature here. All features are free to try, month-to-month billing, cancel at any time. InfluencerBot is currently in beta and we are accepting requests on an individual basis.